We know technology has reduced the world to the size of a global village. But not many of us really believe how small that village has become and how this could actually have such a real and profound impact on everyone – including the isolated populations in the middle of the vast Pacific ocean. Certainly not until the United States President Donald Trump and North Korean leader Kim Jong Un’s war of words escalate to the point it has reached today, where we suddenly find ourselves in the middle of a growing world crisis. The latest development has seen North Korea threated to detonate a hydrogen bomb in the Pacific. Should we be disturbed? Should we be worried? Absolutely. What this has done once more is to prove just how vulnerable we all are to the outcome of global politics, even when we’ve had absolutely nothing to do with how they started and the level it has reached. And just like how powerless we are to stop the biggest emitters responsible for climate change, global warning and all other global crises, we are just as powerless against North Korea’s threats. It means all we can do is pray and hope that these big kids will come to their senses otherwise we are in for a very interesting time. While the Pacific Ocean might be the one of the biggest in the world, the Pacific countries are not that far apart. It means any threat on the Pacific should be taken very seriously. The nature of the behaviour of Kim Jong Un is nothing new. Call it bizarre or whatever you like, what’s disturbing is that he has been threatening the Pacific for sometime now. The real worry is that one of these days, he might just do it. Can we defend ourselves against such a possibility? What do we have to offer in response? Sadly, apart from Trump’s threat to “totally destroy North Korea” if they touch the Pacific, we are sitting ducks at the mercy of these big nations. Nuclear testing of course is nothing new to these parts of the world. The French have done it before on Mururoa in French Polynesia. But that was a long time ago and under very different circumstances. This is scary stuff, especially in this day and age where these big nations have access to such amazing technology that could cause so much more damage. So far, the Pacific leaders have not been quiet about the threat. 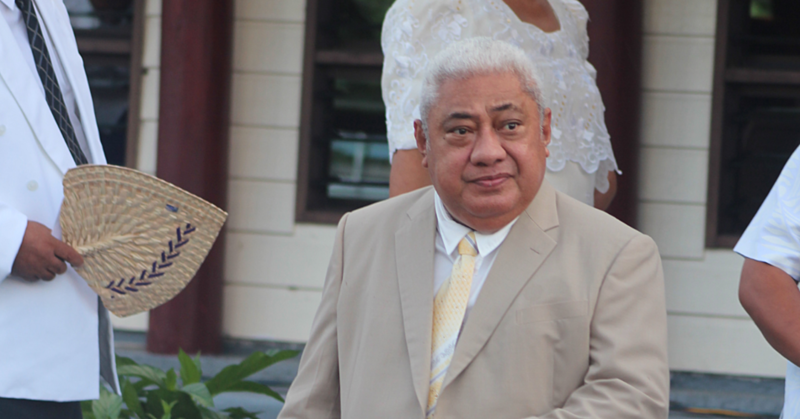 Three weeks ago in Samoa, Prime Minister Tuilaepa Sa’ilele Malielegaoi joined 18 other Pacific Island Forum Leaders to condemn North Korea, saying any threat on Guam is a threat to the Pacific. Tuilaepa was supported by leaders like Australia’s Prime Minister, Malcolm Turnbull, whose countries are also affected. Whether North Korea’s latest threat is in response to the Pacific reactions, the fact remains our leaders cannot be complacent about what is happening. In New York this week, Prime Minister Tuilaepa is leading the charge in voicing the Pacific’s views. “As small island Pacific countries, we are no longer protected by our isolation - we are bystanders but with the greatest to lose in the unfolding power drama being played out in the Korean Peninsula,” he told World leaders at the UN General Assembly. Closer to home, Acting Prime Minister, Tialavea Tionisio Hunt, knows we are powerless to protect ourselves. But he is a man of faith, relying on divine intervention and the power of prayers. Well we couldn’t agree more. As a Christian nation, we know our only response. We might not be big enough and able to protect ourselves but we serve a God who listens to prayers and supplications. Have restful Sunday Samoa, God bless!